Place the mouthpiece of the ocarina between your lips, and tip the end farthest from you slightly down. Cover all 4 holes on the instrument and blow gently but firmly through the mouthpiece. Blow as if you were gently blowing out a candle. This will create the first tone, known as low Do. Open all four holes on the ocarina, and blow gently again to play the second tone, or the high Do. Lift your fingers,one or two at a time, off each of the holes as you blow, then place your fingers back over the holes when you are done. This will create random notes. 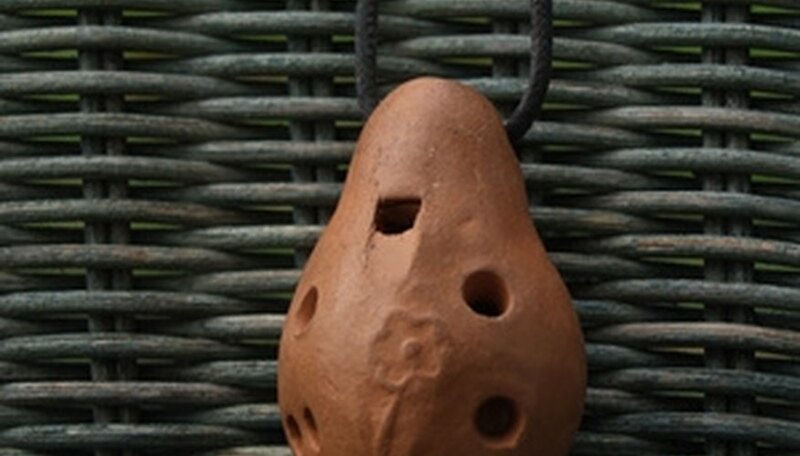 Practice saying, "tu tu," as you play the ocarina, this will help make clear breaks between the notes. Wiggle your fingers as you blow, and flutter your tongue, this will help make more interesting sounds. Also try humming. Keep the ocarina at room teperature. Extreme heat or cold could cause the instrument to crack. How Does a Clarinet Work?